One of the best ways to bring the community together and promote security is with a community shredding event. Shred events allow people in the community to come to a location and shred all of their confidential documents with the help of a mobile shredding truck. This is a great way to not only sponsor an event promoting security for you community, but also gain publicity for your business. 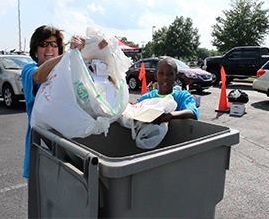 Hosted in cities across the country, shredding events help to make communities a safer place to live and offer benefits to all participants—even event sponsors. Here, we walk you through the steps to setting up a community shredding event, detailing information ranging from what a community shredding event is, why your company should consider sponsoring one, and how to set up and promote your shredding event to ensure it is a successful one. Would you like to learn more about hosting a community shred event? Check out these articles, videos and more! Before you sponsor a shredding event, it’s critical you take the time to make proper preparations and ensure you host a successful event. Use this article to learn about the key components to organizing a shred event, including recruiting volunteers, shopping for shredding services, and finding the ideal event location. With all the steps taken to organize your community shredding event, all that remains now is to ensure you have participants to attend. Find everything you need to know about your promotional options and strategies with this shredding event marketing guide. Get Free, No Obligation Quotes on Shredding Services Today! If you have any questions about our shredding services, or already know what you need, feel free to fill out the form to the right or give our experts a call at (800) 747-3365.